Guns N’ Roses in Toronto! thrawn had two extra tickets and convinced lunato and I to buy them off him. Guns N’ Roses man! Guns N’ Roses! all three of us, skid, thrawn, and I, we grew up listening to Guns N’ Roses and have virtually all of their songs etched into our brain. So, lunato and I went to the concert and wow, what am amazing concert. Simply spectacular. 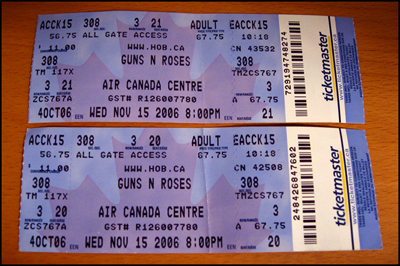 4 and a half hours after the gates opened the lights dimmed all of a sudden and the intro to Welcome To The Jungle rocked the Air Canada Centre. Almost two hours later they finished the show with an extended version of Paradise City. The pyrotechnics during the show were so damn loud but so well-placed and well-timed. Each time the fireworks went off it felt as if the roof would crack open. The only complaint I have was that they didn’t play Madagascar… but all the other songs.. You Could Be Mine, Knockin’ On Heaven’s Door, Nightrain, Sweet Child O’ Mine, November Rain, Mr. Brownstone, Don’t Cry, Yesterdays, etc. etc. were just great. The new songs, Better and There Was A Time are also very good. This entry was posted in 2006, Concerts. Bookmark the permalink. 1 Response to Guns N’ Roses! !